When the Boss is active on any of the phone lines, the Admin can visually see on the Admin's own phone. Any incoming call to the Boss lines can also be answered by the Admin. As long as there are enough keys on the Admin's Nortel phone, the Admin can monitor line appearances for Boss #2, Boss #3, etc. in the same manner. On the Admin's Nortel phone, two types of keys can be programmed to monitor the Boss extensions: a Ringing BLF (Busy Lamp Field) or a non-ringing BLF key. To have a non-ringing BLF key, configure xxxxB in the Digits field (where xxxx is the Boss extension) and enter an appropriate Label. To have a ringing BLF key, configure xxxxR in the Digits field (where xxxx is the Boss extension) and enter an appropriate Label. Note that the additional line appearances of an extension can only be programmed on Nortel phones that support programmable key buttons. In this scenario, a company has an emergency number (e.g. 2000) that users can dial in an emergency. All members of the emergency team will have their phone ring when a call is placed to the emergency number. Navigate to PBX -> PBX Configuration -> Follow Me page. Select extension 2000 from the list on the right side column. For Ring Strategy, select ringallv2. 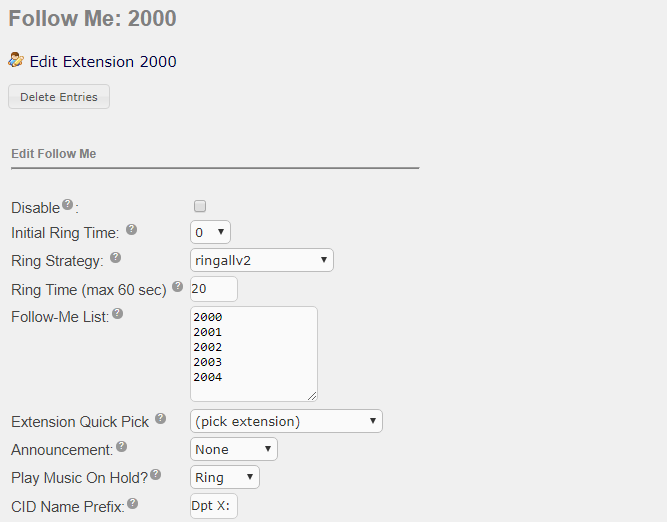 In the Follow Me List, enter the extensions: 2001, 2002, 2003. You can also enter a CID Name Prefix (e.g. EMER:), so the Calling ID name will be prefixed with "EMER:" when ringing extensions in the Follow Me List. When a call is placed to the emergency number 2000, all emergency team member's phone will ring on their primary phone line. The Calling ID will also have the "EMER:" prefix to indicate that this is an emergency call. Navigate to the PBX -> PBX Configuration - Extensions (Nortel) page and create a Nortel virtual extension. Create similar Nortel virtual devices for extensions 2002 and 2003. Any inbound call to extensions 2001, 2002 or 2003 will ring their respective keys on the Front Desk phone. Note that the line appearances of virtual extensions can only be programmed on Nortel phones that support programmable key buttons. In this scenario, different phones need to be called and answered when a single directory number is called. 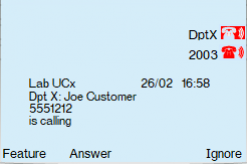 The scenario can be used for answering inbound calls and/or extension-to-extension calls. For example, a department has a published number (DID) for receiving inbound calls, or inbound calls are directed to the MADN department number by an IVR menu selection; all calls to the department number can be answered by multiple extensions within the department. Navigate again to the PBX -> PBX Configuration - Extensions (Nortel) page and edit that same Nortel virtual extension. You can also enter a CID Name Prefix (e.g. "Dpt X: "), so the Calling ID name will be prefixed with "Dpt X: " when ringing extensions in the Follow Me List. When a call is placed to the Department number 2000, all department team member's phone will ring on their primary phone line, and the MADN indicator will . The Calling ID will also have the "Dpt X: " prefix to indicate that this is a call to the Department MADN extension. Navigate to the PBX -> PBX Configuration - Extensions (Nortel) page and edit each employees' Nortel extension. On each Department Employee’s extension program ringing or non-ringing BLF key by selecting "Other" from the drop down menu in Programmable Keys section, then create a Label ("eg. DptX"), and assign the digits as 2000R for a ringing BLF key or program a non-ringing BLF key 2000B. 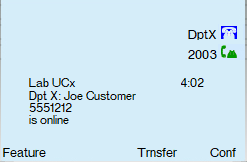 Any call to Department X extension 2000 will ring Employ A, B, C and D extensions and present at the respective BLF keys with the Caller ID of Dpt X: <CallerID>. Once the call is answered on one of the MADN telephones, the call will appear on only the actual DN of that set, and the MADN appearance ("DptX") will become idle.